Hola! Welcome to the AMAUTA Spanish Schools blog! At our Spanish Schools in Cusco and Buenos Aires, we provide the best Spanish courses and cultural immersion experiences for our students. We encourage our students to step outside of the Spanish classroom, to enjoy the local culture, make Spanish-speaking friends, and travel in Peru and Argentina. During or after finishing your Spanish course, we greatly encourage participation in our volunteer program in Cusco or Buenos Aires, where you will really get the chance to practice and improve your Spanish language skills and give back to local community. Here at our AMAUTA blog, we aim to keep you posted about what is happening out our Spanish schools, as well as what´s going on in and around the cities of Cusco and Buenos Aires. We´ll also post fun articles about Peruvian and Argentinian culture, cuisine, local fiestas, what to see in Cusco, & where to go in Buenos Aires, etc. We´ll include advice about which weekend excursions to sign up for and which free cultural activities are available. And after reading our section of student reports, you´ll know exactly why you want to study Spanish at AMAUTA in Cusco and Buenos Aires. Just an hour’s drive from Cusco, the Sacred Valley of the Incas in Peru is named after its importance to the Inca, whose ruined citadels and former agricultural terraces are dotted along the valley’s course. It’s an awe-inspiring place to visit, flanked by serrated mountains and lush with corn that grows beside the Río Urubamba that flows right along the valley floor. For any visitor to Cusco, the Sacred Valley of the Incas is an unmissable spot on your trip to Peru. Avoid just passing through on the way to the epic Inca fortress of Machu Picchu and instead spend a few days exploring one of Peru’s largest and most dynamic artisan markets, pre-Colombian salt mines and even one-of-a-kind hotels installed high up on the valley sides. Join us as we rundown the eleven Must Visit Sites and best things to do in the Sacred Valley. Spoiler: yes, AMAUTA Spanish School offers Spanish classes at this amazing location (see #11)! Heading on a trip to South America this year and want to make sure you don’t make yourself and those around you completely confused? Having a toolkit of invaluable travel sayings at your disposal will ensure your plans don’t go awry and it’s for that purpose we’ve put together this Spanish for travelers guide. The 68 travel phrases have a particular focus on South America, where expressions sometimes have a distinctly different character than in Spain. One of the easiest ways to pick up a new language is by studying abroad, where you have every opportunity to put your new linguistic skills to the test. 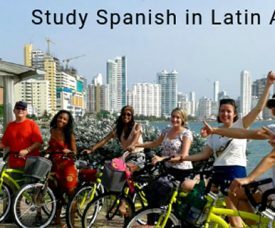 Although Spain might seem like the obvious choice, the best place to learn Spanish is actually South America. Not only are Spanish language classes affordable, local accents are comprehensible and you also get the chance to explore a new continent. 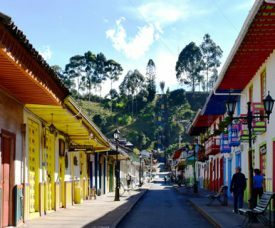 But it’s a big place to choose from, so that’s why we’ve put together this run down of the six most unmissable places to learn Spanish in South America. From the Inca heartland of Cusco to the pampas of Argentina via the beaches of Colombia, there are plenty of places to immerse yourself in Spanish. ¡5 postres argentinos típicos que no te puedes perder! A Quick Guide to Cusco’s Street Food! 1 Week Of Spanish Classes in Peru FOR FREE: book 4 & get 5! 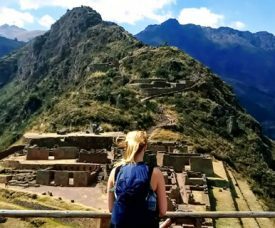 Wat te doen in Sacred Valley: 11 tips & sites die je moet bezoeken! Waarom Spaans leren? 7 goede redenen!